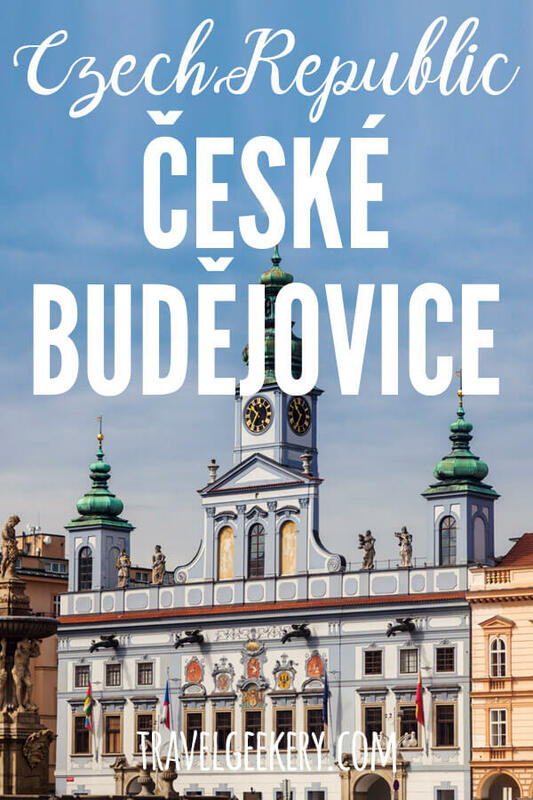 I took my first trip to Ceske Budejovice when I was 13 while on a camping trip in the region with my parents. Since that was a looong time ago, the look of the town got totally wiped out of my memory and all I could remember was the shiny tennis racket that my father bought for me there. Perhaps it’s the Budweiser beer that’ll lure you to Ceske Budejovice Czech Republic. So be it! But if you do decide to go, you should be well aware there’s more to the town than the liquid gold. 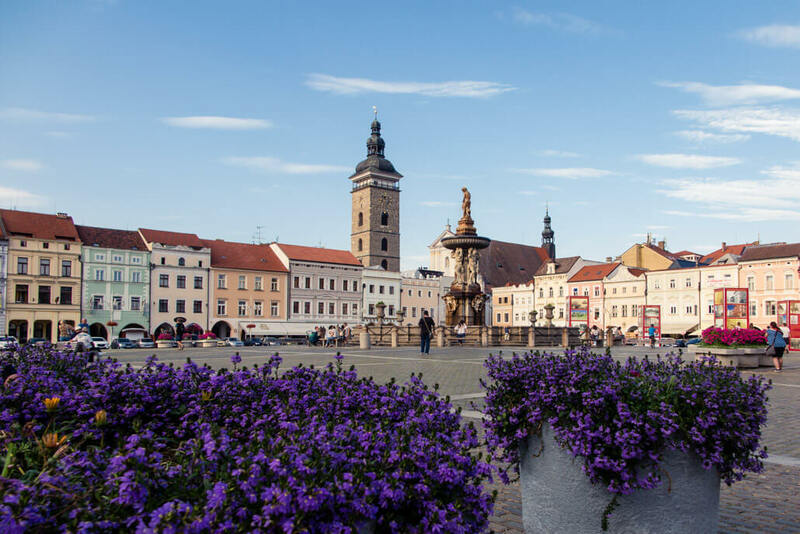 Ceske Budejovice is the capital and the largest city of South Bohemia with about 94,000 inhabitants, making it the 7th largest city in the Czech Republic. Where is Budweiser from? Where is Budweiser brewed? 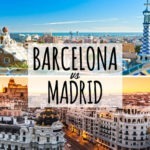 What are Budweiser brewery locations? Is Budweiser beer Czech or American? 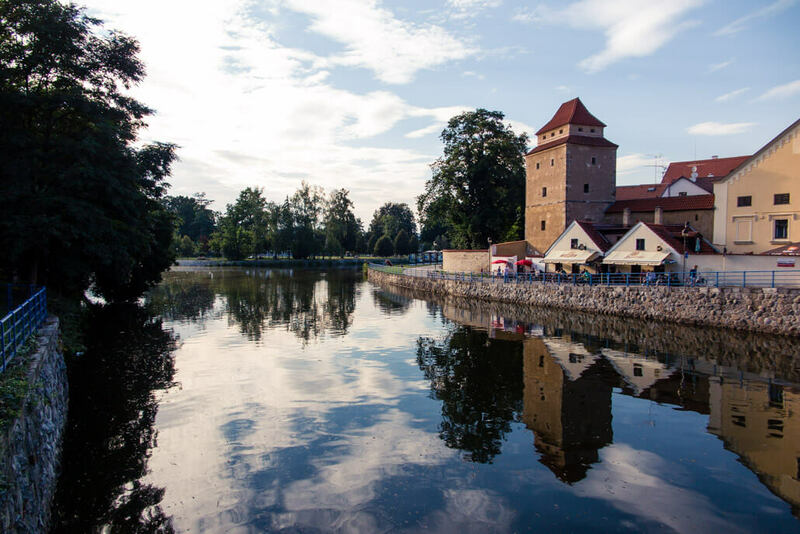 Founded as a royal town in the 13th century by King Přemysl Otakar II., the city played an important role in the region – not just for its right to brew beer, but also for military reasons. 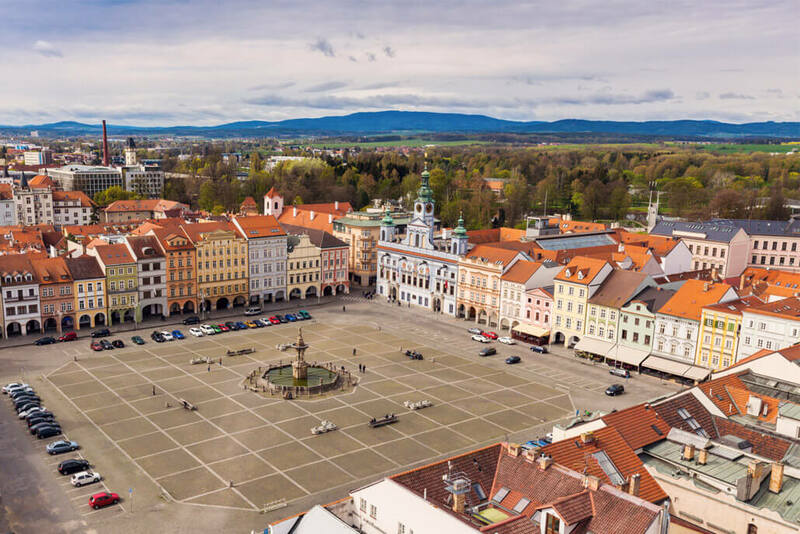 In the 19th century, the first railway in continental Europe was built, connecting the city of Ceske Budejovice and the Austrian town of Linz. Don’t imagine a locomotive, though – the carriages were horse-drawn. I would never advise you to skip the Budweiser Brewery. It’s a classic and one of the most important breweries in the Czech Republic. In fact, it’s the only one that’s state-owned until this day. All other major Czech breweries are parts of international brewing groups such as Anheuser-Bush InBev. The Budweiser Budvar Brewery was officially founded in 1895, even though the city, one of only a few in the country, had the right to brew beer a several hundred years before that. The beer is brewed here using world-class hops from Žatec called ‘Saaz hops’. Together with especially pure water originating from Ice Age taken from a 300m deep well (which doesn’t have to be chemically treated! ), the Budvar beer quality is second to none. I won’t describe exactly how the Ceske Budejovice beer is made – you have to go see it for yourself on a Budweiser tour. 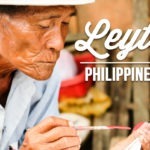 The whole process is quite fascinating, though, and will excite even non-drinkers. The large tanks where magic happens, the technology, the bottling production line.. It’s all unique and captivating. Yep, we’re in the brewery! What is the relationship with the American Budweiser Company? There is legal battle still looming, but one thing is clear – the Bohemian Budweiser Budvar is the only original. In the court proceedings, even A. Busch himself confessed already in 1894 to copying the Budweiser original brewing recipe and following it when producing his own beer. 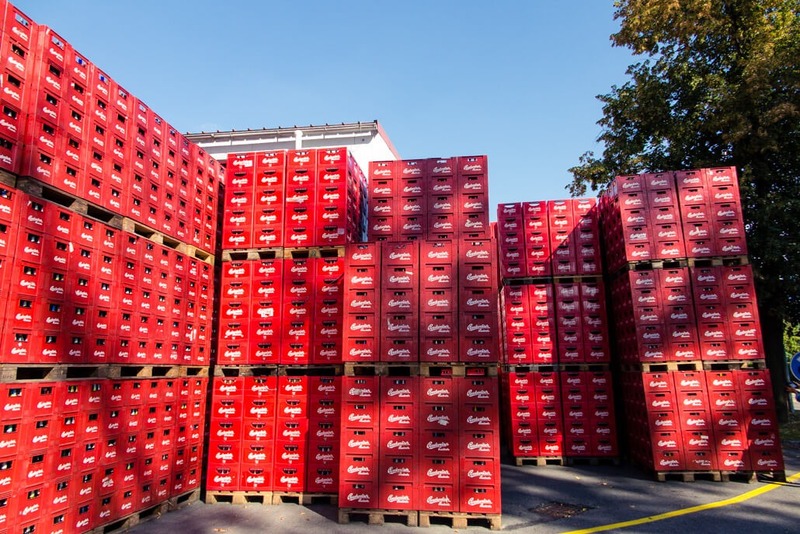 Nowadays, the Czech Budweiser Budvar is allowed to use the Budweiser trademark in most of Europe, while the American rival Anheuser-Busch InBev dominates North America. If you want to buy the original Budweiser in the US, you need to look for ‘Czechvar’. You can read more about the dispute on Wikipedia. It’s clear Budweiser history and origins are connected to the Czech Republic, but the fact that the American side registered Budweiser trademark on the North American market first gives them the right to use it there. Wherever in the world you are, if you order the real Budweiser, you can rest assured it was produced right here in České Budějovice based on their 700 y.o. recipe. There is no other Budweiser factory located anywhere else on the planet. Ceske Budejovice, Czech Reublic. The city is also called Budweis in English, referring to its German name. The one and only Budweiser brewery lies in Ceske Budejovice Czech Republic. No. While both Budweiser and Pilsner are lagers, Budweiser is not of the Pilsen type. The Czech state. Budvar Brewery is the last major state-owned brewery in the country. The original Budweiser beer is Czech. 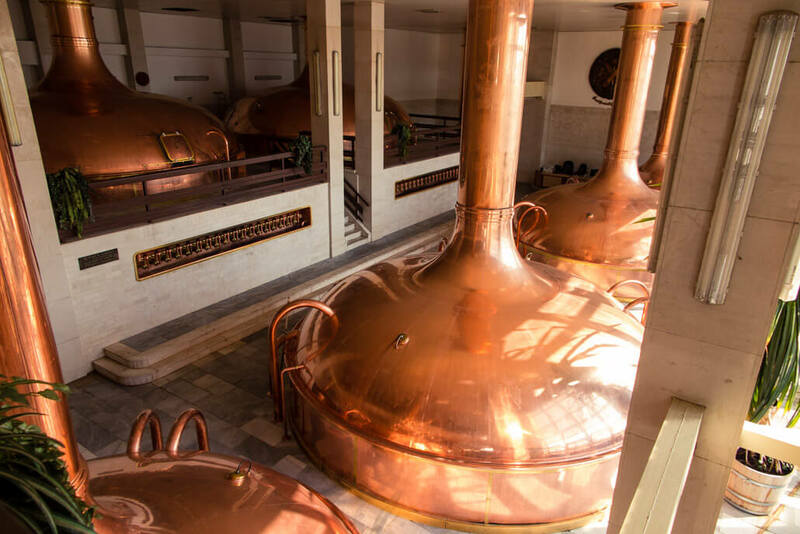 Tanks in Budvar Brewery – I believe it’s inside these where water, malt and hops create the magic that’s beer. AB-InBev has already put their foot in the door by acquiring another Ceske Budejovice brewery – Budějovický měšťanský pivovar – in 2012. If Budweiser Budvar is ever privatised, we know who the buyer’s going to be. So go visit it while it’s still fully in Czech hands! Once you enter Ceske Budejovice’s main square, the Náměstí Přemysla Otakara II., you’ll be glad you didn’t come for the brewery only. České Budějovice is a city of students. The University of South Bohemia is located here. 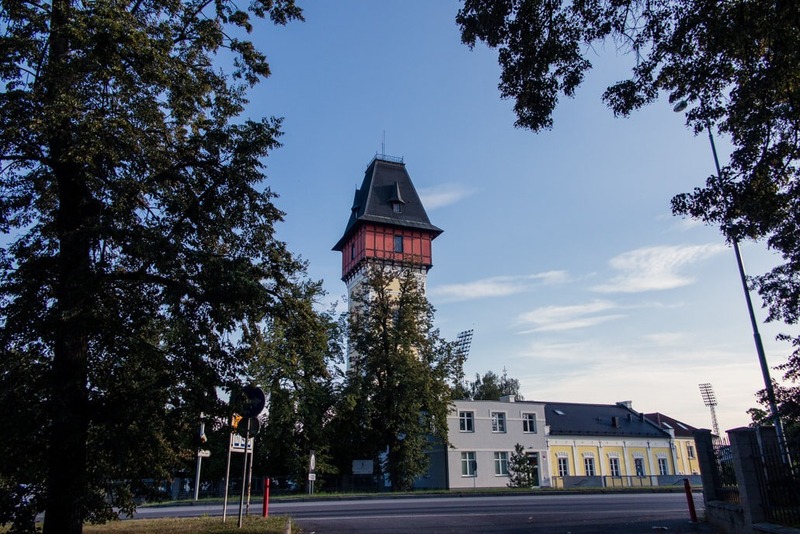 So what are the main things to see in České Budějovice that you absolutely shouldn’t miss? With its size of 133 x 133 m (436 x 436 feet), the Square of Přemysl Otakar II. happens to be the 2nd largest in the country, after the Charles Square in Prague. It’s beautifully lined with colorful baroque merchant houses. Your eyes will naturally be drawn to the most exquisite building in the corner of the Square – that’s the City Hall. Originally built in Renaissance style in the 16th century, then rebuilt with Baroque features, the town hall has recently been beautifully reconstructed and is inarguably one of the prettiest I’ve seen in the Czech Republic. 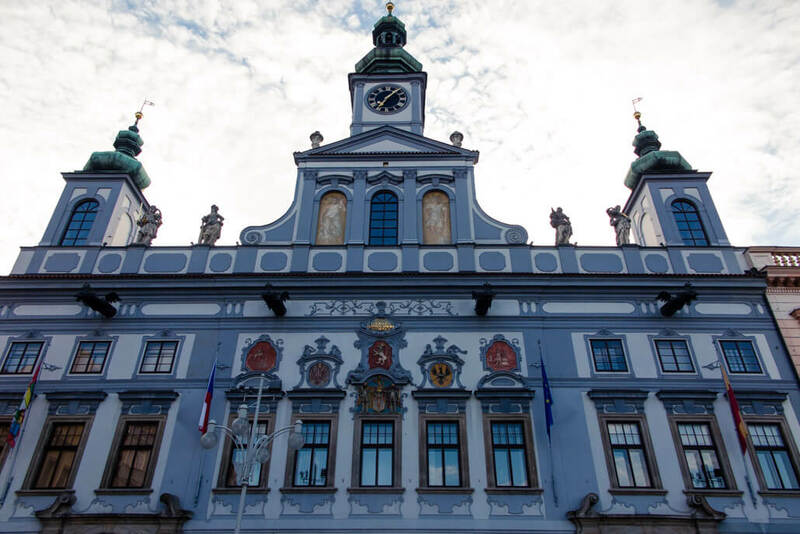 Ceske Budejovice City Hall – I couldn’t stop admiring the building! Right in the middle stands the majestic Samson Fountain. The large fountain was built to supply locals with water. 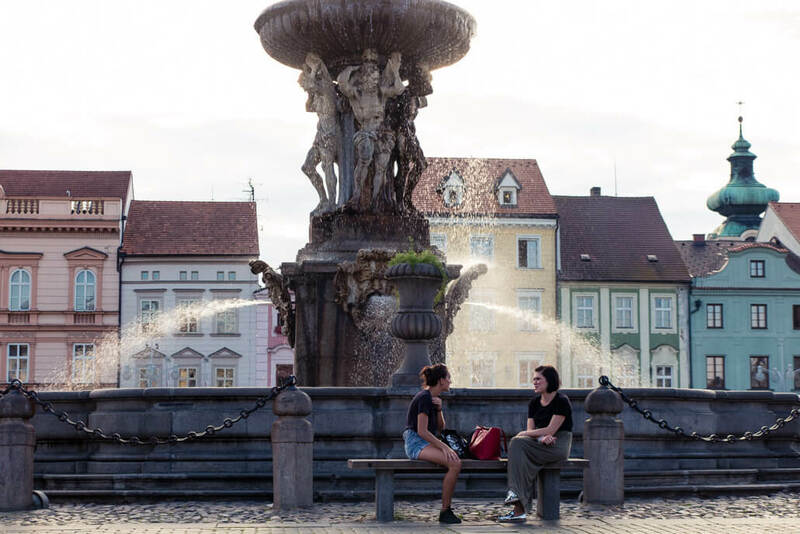 Nowadays, its purpose is purely decorative, but it stops even locals in their footsteps, who can often be found sitting on the benches and chatting the (summer) days away. Near the fountain you’ll find an odd-looking rock sticking out of the otherwise perfectly cobbled surface. In no way should you cross over it after 10pm! It’s a former executioner’s block, so people used to be executed here. The current legend says that if you cross over the rock, you’ll be wandering the streets of Budejovice until the morning and won’t find your way home. Visiting the Přemysl Otakar Square and admiring all the various structures there is clearly one of the main Ceske Budejovice things to do. It’s easy to spot the standalone tower whenever you are in the Square. It sticks out and – well – it’s black. It belongs to the St. Nicholas Cathedral and is open to public. 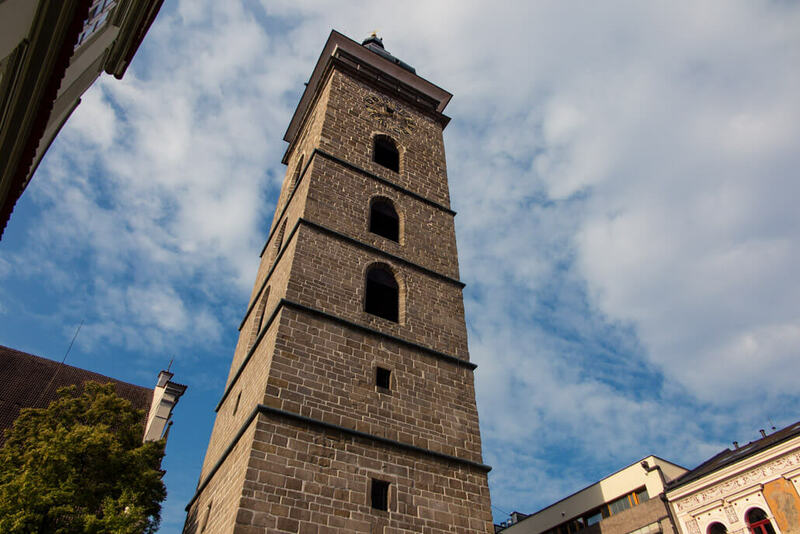 Climb up the 225 steps to enjoy beautiful views of the Budějovice Square from the top. The tower was built in the 16th century to serve as a guarding spot. A guard lived in the tower with his family and was responsible for spotting any danger, such as fire. The family used to live in the uppermost floors of the tower, above its bells. Even a goat supposedly lived in the household with them! The Black Tower. How a goat could live all the way up there remains a mystery to me. 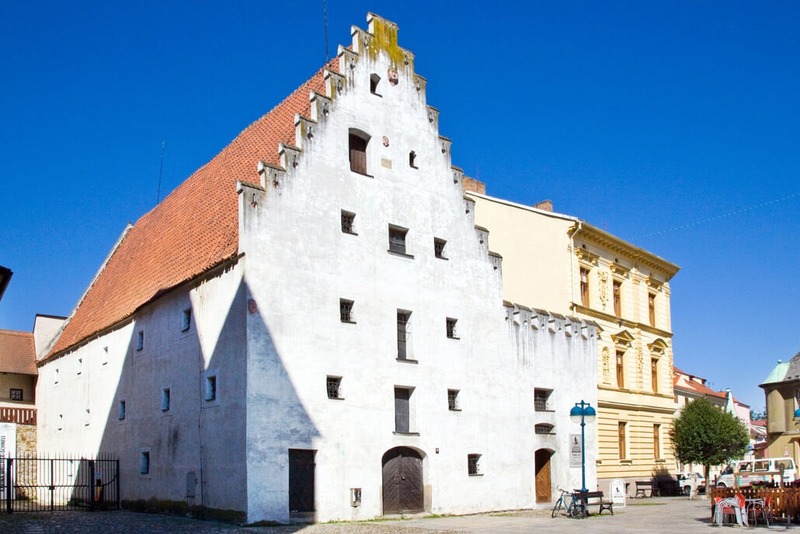 Locally known as Masné krámy, a building with a unique façade is where the meat market once flourished in the 16th century. There’s of course no meat for sale there anymore, instead the space serves as a beer hall housing a Czech restaurant. The name? Masné krámy! 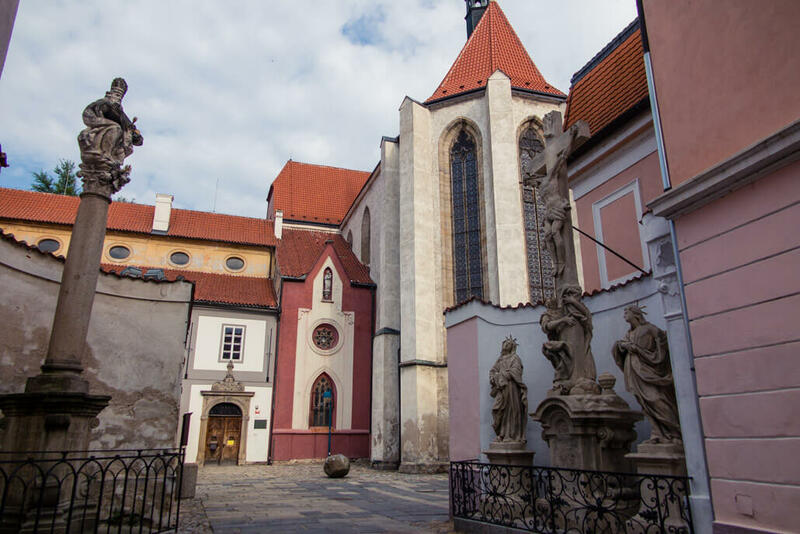 There’s a gothic church from the 13th century in the middle of the Square – the Church of Presentation of the Blessed Virgin Mary. Together with the adjacent Dominican Monastery they are officially the oldest buildings in the city. If you look close enough, you’ll notice a small sculpture of a frog on the church’s façade – legend has it that once the frog climbs all the way to the top, the world will end! 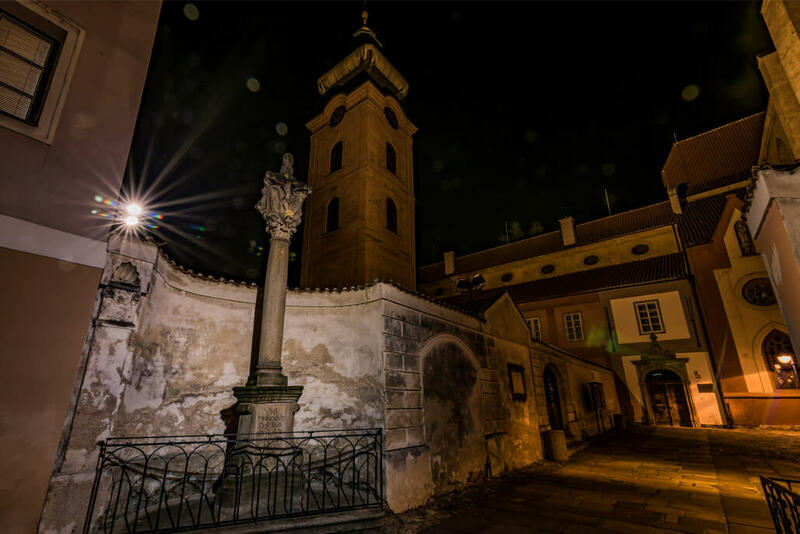 Piarist Square at night… a little spooky, eh? Another building worth at least a few photos is the Solnice. Built originally in the 16th century as a grain storehouse, it was later used as an armoury, and finally as a salt repository which gave it its name. The design of the building is unique and it quickly reminded me of houses in the Netherlands. You’ll be perhaps puzzled by the shooting holes in each of the front façade’s ‘steps’, as well as by the irregular windows and 3 random-looking faces made of rock. They’re in no way random, though. Apparently, they belonged to thieves who were caught stealing in the church and then beheaded for their wrongdoing. 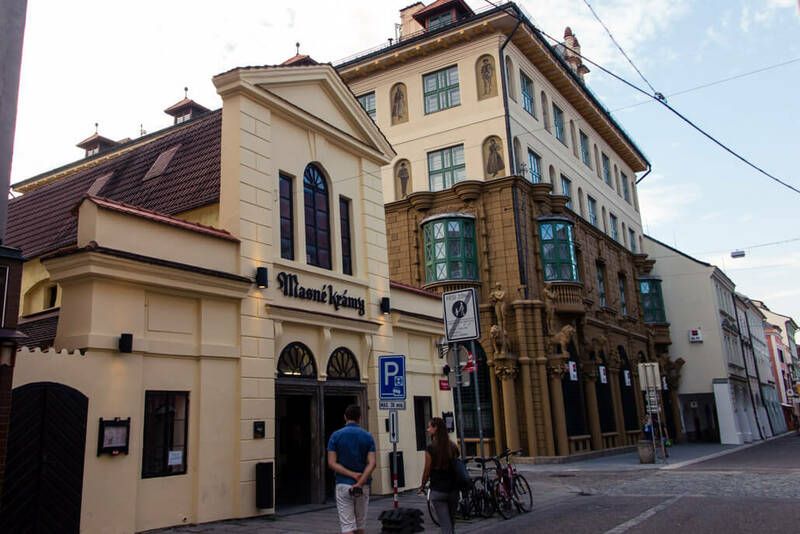 Currently South Bohemian Motorcyclist Museum is housed inside the building. At the time of my visit in August 2018 Solnice was under reconstruction. I enjoyed walking along the calm Malše River in Budějovice, which joins with the Vltava River and then continues northwards as the Vltava. There you’ll see many students hanging out by the river, drinking beers and perhaps even preparing for tests and exams. :) There’s a summer cinema nearby, sometimes even with movies with English subtitles. Just before you reach the first of the two main bridges, you’ll see the Iron Lady. This is no reference to Margaret Thatcher, but rather to a medieval torture instrument that used to be located inside. The small tower formed a part of medieval fortification around the city, of which just very little withstood the test of time. 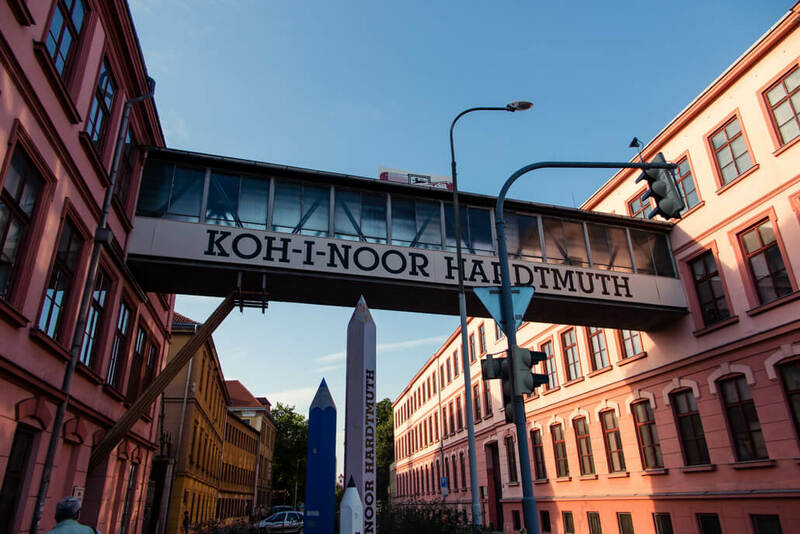 Since 1847, pencils have been made in České Budějovice at the Koh-i-noor Hardmuth factory, which still stands until today. The quality pencils and crayons they produce are quite famous in the rest of Europe, especially the former Soviet bloc countries, and they make for great souvenirs. One of the oldest towers in South Bohemia, this Water reservoir stands near the Vltava River in an otherwise not so interesting area. It sometimes opens to public, but generally just during summer time. Apart from a decent view, there are often exhibitions housed inside the tower. 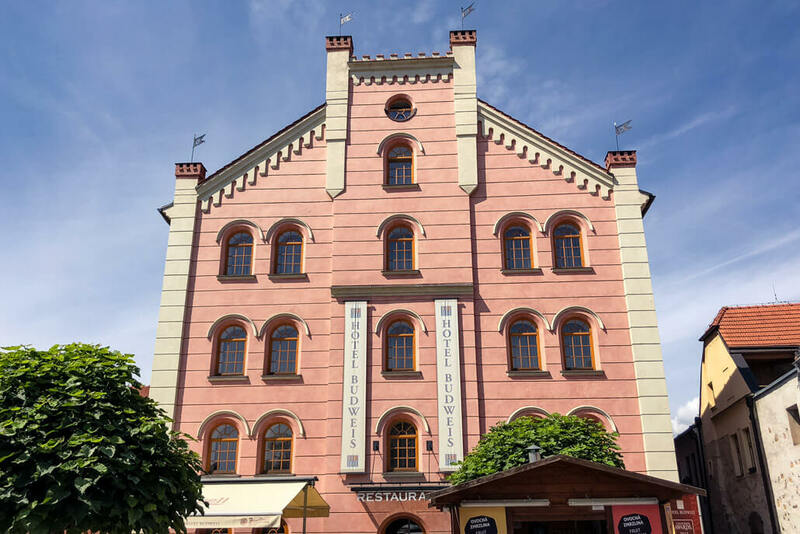 This is the main museum in Ceske Budejovice, featuring everything related to the city and the whole South Bohemian region – from history and culture to architecture, art, music and pretty much everything you could think of :) The museum is closed on Mondays. 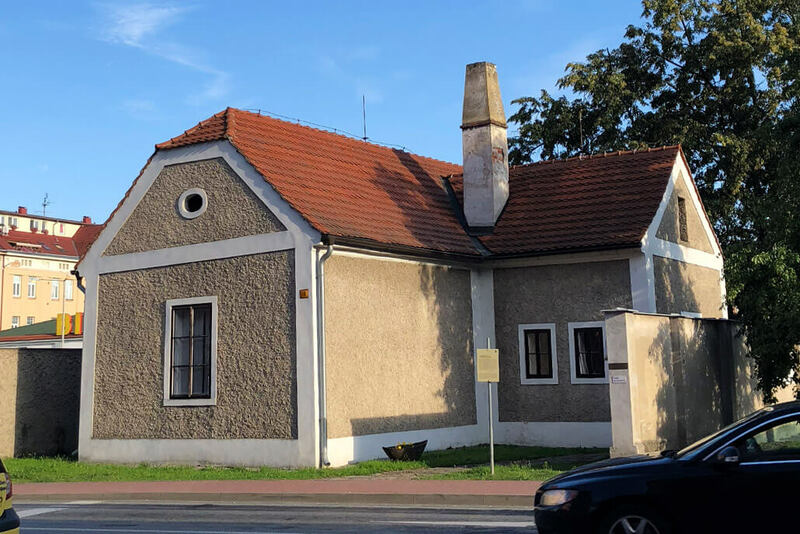 This museum features a permanent exhibition of the first (horse-drawn) railway in continental Europe leading from Ceske Budejovice to Linz Austria. The museum is housed in the original building of the train station guard. Everything is original, except the building had to be moved by a few meters to allow the widening of the adjacent street. While I haven’t personally visited this museum, it can be fun if you’re into interactive exhibitions. Apparently, all the tools on display can be tried out! 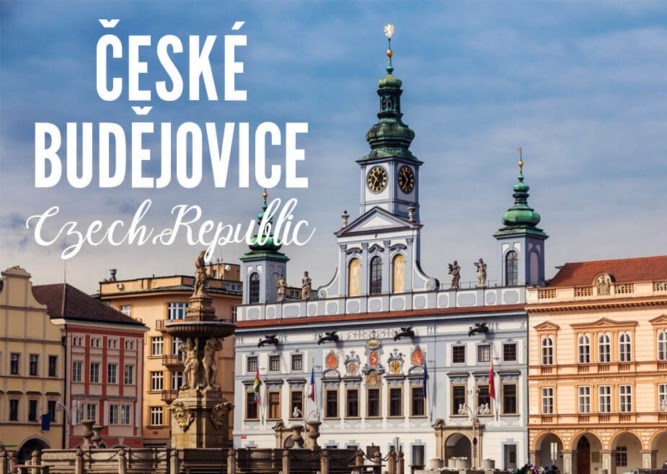 Check out also this guide of things to do in Ceske Budejovice. 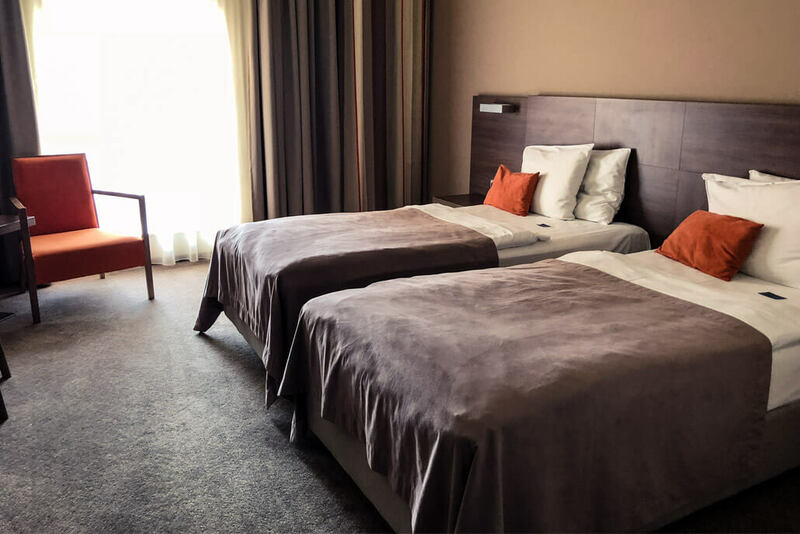 The beauty of hotel Budweis will amaze you as soon as you arrive, and you’ll find that the rooms are tastefully decorated and comfortable. I always deeply care about the breakfast, and I can tell you that they have one of the best hotel breakfasts that I’ve ever had. Yum! Apart from the above-mentioned Masné krámy, I can highly recommend one more restaurant – the Restaurace Klika. It features excellent modern gastronomy combining typical Czech meals with international flavors. 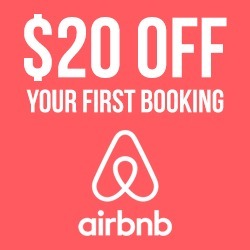 You’re left with two options if you don’t have a car – bus or train. From Prague, the journey takes 2 hours. It doesn’t really matter whether you choose a bus (Student Agency company) or train as they take the same amount of time. 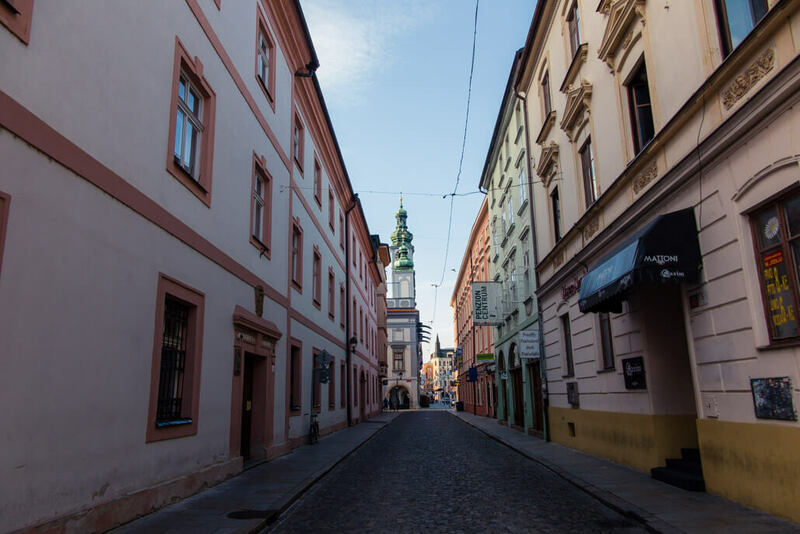 Once you taste the Budweiser lager, Ceske Budejovice will become your favorite city. But don’t let your experience be limited to the beer only. 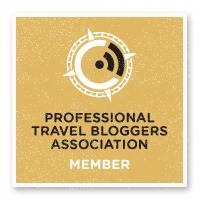 Have you been anywhere in the Czech Republic other than Prague?